Today in the daily doos! HA, that popped in my head, and I thought, that sounds like a fun title! I decided I would make a slide show to share with you what was on this weeks daily doos agenda. As you can see I have been busy! A lot of people ask me, how I get so much done in a day. Well, I really don't! It appears that way, but these things are spread out over the course of the week. I am a multi-tasker to the best of my ability these days. I used to be able to whip things out in no time. Now, it takes me a wheee bit longer! How about you, are you a multi-tasker, or do you have to finish what you start? I am getting ready for the Spring'tacular party! Hope to see you here beginning March 12th! THERE will be NO NEWBIE party that day, the Magazine copy cat challenge will be in lieu of it. I love the daily doos! You were busy this week!! Now that was alot of fun! You have been busy indeed. I spotted a whole bunch of things that I can't wait to see! Looks like some very interesting projects you are working on there. I am just as impressed with the fact that you still manage to find time to discover and use so much new "technology" on your blog too. That was an enjoyable slide show! You are a busy woman for sure! 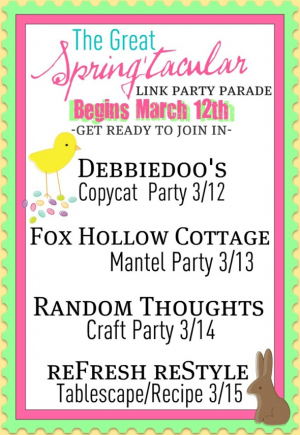 Your Spring creativity is in full swing Deb! You certainly had a busy week. Love all the rooster stuff. Have a wondrerful day. That was super cute. I can't wait to see how you made those paper flowers. They look great. Oh, I can't wait to see! It looks like you are having a busy week! It is going to be so much fun to see all the spring decor! I loved the slide show! I luv how you continue to come up with creative projects to show off. Keep it up! And you had time to make a slideshow tooooo!!! I have to finish when I start a project. Hence I know what I'm doing for the magazine challenge and when I start it, it will be done that day. I'm actually chomping at the bit to start it too. You have been busy this week Debbie, love coming over and seeing all your new Ideas. My Tablescaps are a full time job now but I love it, Thanks so much for your sweet comments on my new Tablescape. I see I'am following your new linky now. I hope you have a wonderful week Debbie with your family. Daily "DOOS" love it!!! Good slide show! That was fun. Yes, you are a multi tasker! Wow! You still rock in my book! You get more done than most dream about! I have lots of ideas but lack the will! I'm working on it though!! I blame winter and too much chocolate on that! LOL! That was a really fun video, Debbie! You have been busy! I'm definitely a multi-tasker, but I do have to keep them kind of compartmentalized in my craft room. I don't work well when things get too messy & cluttered. Thanks, Debbie, for your nice comment on my new blog header. I really, really like yours, too! I'd love to know about your techie knowledge. I'm not proficient in that area at all. Blogger is still not allowing me to change My Blog List. You're one heck of a multi tasker! You are such a busybody!! I could never keep up with that energy!! But you're so good at what you do! Woohoo, send me some of your energy and creativity! and I am working,as we speak, on my 3/12 copy cat....hope a WHOLE bunch of people play along. I like to start and finsh a project. It makes me edgy to have multiple things going on at a time. I've always been that way, guess it's a personality "thang". What is your favorite beauty tool?